John Fitzgerald “Jack” Kennedy, often referred to by his initials JFK, was the 35th President of the United States. After Kennedy’s military service as a P.T. boat commander in World War II, Kennedy represented Massachusetts in the U.S. House of Representatives from 1947 to 1953, and served in the U.S. Senate from 1953 until 1960. He was the first President born in the 20th century, and the youngest elected to the office, at the age of 43. Kennedy is the first and only Catholic president, and is the only president to have won a Pulitzer Prize. Today, Kennedy continues to rank very highly in public opinion ratings of former U.S. presidents. 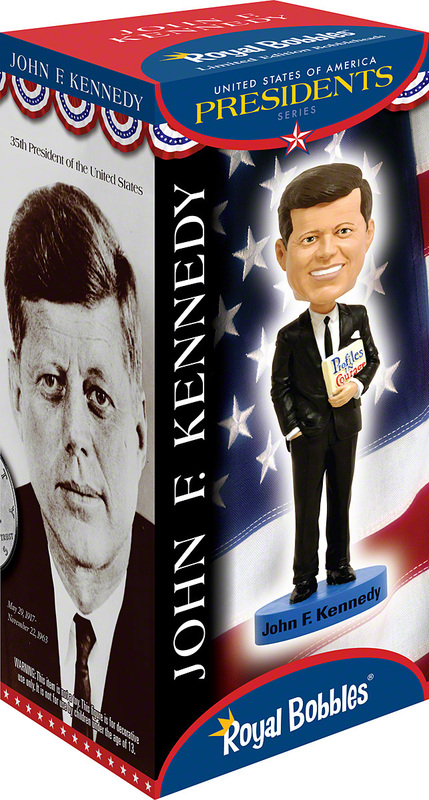 This very high quality, hand-painted polyresin bobblehead shows John F. Kennedy proudly holding his Pulitzer Prize-winning book, “Profiles in Courage”. This product is shipped in a colorful collectors box, securely packaged in molded styrofoam protection.